Now Available in eBook Format To Access on Any Device! All for just $58 $30! 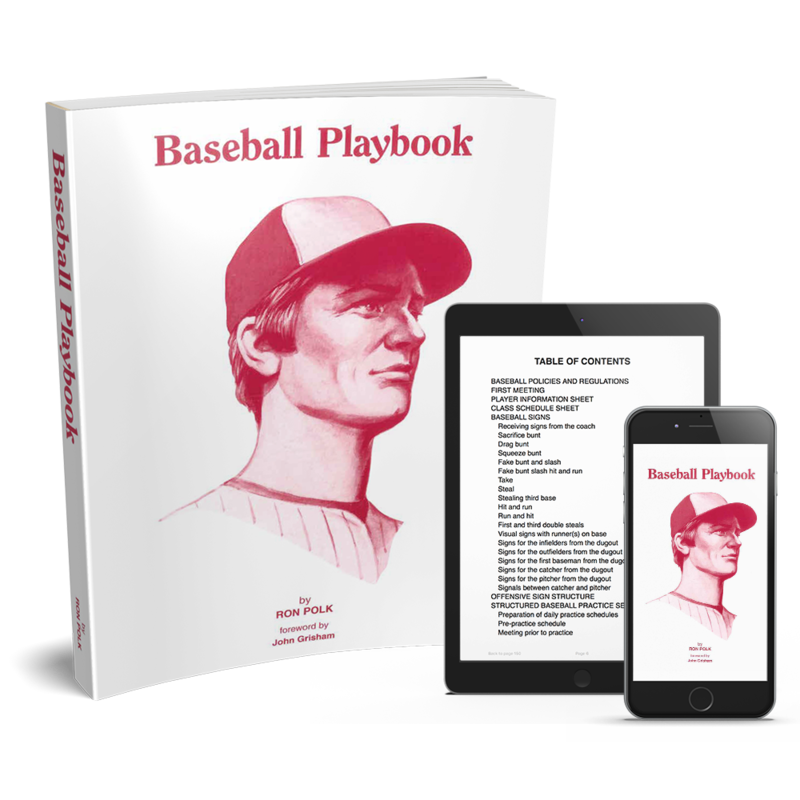 GET BASEBALL PLAYBOOK+ FREE eBOOK & FREE SHIPPING! All for just $20 $15! Is this different than the original Baseball Playbook? No… While we are in a new era, the bases are still 90′ and the mound is still 60′ 6″ away from home plate. That is the beauty of the Baseball Playbook. With the evolution of technology, the Baseball Playbook is now available in eBook format. What areas of baseball does the Playbook cover? The Baseball Playbook literally covers every area of the game. That is why this has been regarded as the best book in all of baseball. Whether you want to learn how to schedule a practice, evaluate your players, or maintain a field, this book has it all. This is why the Baseball Playbook is 520 pages. Is this book only for coaches? No! This is a great book for any player, parent, coach, or fan to learn more about the game of baseball. While it was written as a resource for coaches, it has valuable tools, drills, and fundamentals that are timeless and have benefited coaches, players, and parents for over 35 years. Can I order multiple copies of the Baseball Playbook for my team/staff? Yes! After adding the Playbook to your cart, you will be able to adjust the desired quantity at checkout. If you order 20+ copies, you will receive a 20% discount + a personal phone call from Coach Polk. In most cases, your book will be delivered within 7 days of your order completion. If any backorder occurs, we ensure that your Playbook will be delivered within 2-3 weeks. Your order confirmation e-mail will include a private download link to add the eBook to the Kindle or iBooks app on any device. What is Coaching Legends VIP? If you order today, you will also receive instant access to both the digital text and audio versions of Coaching Legends VIP. This is a series of exclusive interviews with Coach Polk and Skip Bertman, where they discuss important factors inside the game of baseball, as well as keys to their sustained success at the top of college baseball. Coach Ron Polk was a long-time head baseball coach at Mississippi State and is considered, by some, to be the 'Father of Southeastern Conference Baseball'. Polk compiled one of the most successful winning records, as a head coach, in both MSU and Southeastern Conference history. He currently ranks 9th on the all-time wins list nationally for 10+ year Division I coaches. His teams won five SEC championships and five SEC tournament championships. His teams participated in the NCAA tournament twenty-three times, and reached the College World Series eight times. He is one of only three coaches in college baseball history to coach at three different schools that have played in the College World Series in Omaha, Nebraska. Georgia Southern University – 1973; Mississippi State University – 1979, 1981, 1985, 1990, 1997, 2007; University of Georgia – 2001. He coached teams that played in Omaha over a period of five decades (nine appearances) including as an assistant coach at the University of Arizona in 1966. Coach Polk has also completed seven tours on the U.S.A. National baseball team coaching staff serving as the head coach two times and as an assistant five times. He has coached in the Olympic Games two times - once in Seoul, South Korea in 1988 when the team won the gold medal and the other in Atlanta, Georgia in 1996 when the team won the Bronze medal. Since retiring from head coaching, Coach Polk is still heavily involved in college baseball to this day. He is currently on staff with the University of Alabama at Birmingham Blazers baseball team as a Volunteer Assistant alongside the Blazers head coach Brian Shoop, a former MSU assistant under Coach Polk. Coach Polk now spends his summers coaching in the Cape Cod summer league as an assistant coach with the Hyannis Harbor Hawks baseball team. GET THE PLAYBOOK FOR YOUR TEAM/STAFF! If you order 20+ copies, you will receive a 20% discount + a personal phone call from Coach Polk. After adding the Playbook to your cart, you will be able to adjust the desired quantity at checkout.